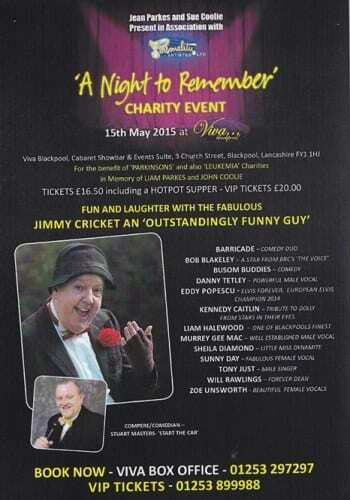 Jimmy Cricket joined a host of fellow top entertainers at a showbusiness event in Blackpool. Encore Reunion was organised by performer Hilary O’Neil, who was one of the stars of the 80s TV show Copy Cats, and was hosted at the Viva cabaret venue in Blackpool. Jimmy, who attended with his wife, May and son, Fr Frankie, was invited to attend by the event sponsor, Nick Thomas from the Qdos Entertainment Company. It was a who’s who from the world of entertainment as also there were: Bobby Davro, Paul Chuckle (from the Chuckle Brothers), Ken Dodd, Billy Pearce, Krankies, Christopher Biggins, Russ Abbot, Robin Grumbleweed and Little and Large. “I was thrilled to have been at this unique event and thought it was a sensational night,” said Jimmy. “I thoroughly enjoyed catching up with my fellow entertainers, some of whom I had not seen in quite some time. The sponsors produced an event brochure, which highlighted the many shows the performers had produced over the years in the resort. Jimmy featured in a few of these shows at venues such as the South Pier Theatre (no longer standing as it was demolished at the end of the 90s) and the Grand Theatre (located within the town centre). Click on either of the arrow buttons above to watch a photo slideshow of the event.